Minor is a genus of about 3000 species of moulds. . It is a common saprophytic fungus. It grows on dead organic materit I. It is commonly found in soil, digestive systems,plant surfaces,and rotten vegetable matter. In laboratory we can culture this fungus by keeping moist bread under bell jar for two or three days. The fungal mycelium looks like fine cottony threads on the surface of breads, pickles, shoes etc. Afterwards, it forms black spores. Therefore, it is converted into black mass. Thus it is known as black molds. Its common species is M mucedo. Colonies of this fungal genus are typically white to beige or gray and fast-growing. Colonies on culture medium may grow to several centimeters in height. The mycelium is white, very fine profusely branched and intei woven. These are coenocytic. Each hypha consists of n umerous small nuclei. It also has glycogen and oil drop. These are embedded in grainular cytoplasm. The fungus is heterotrophic in their mode of nutrition. Certain hyphae (rhizoidal hyphae) secrete some enzymes. There enzymes convert insoluble carbohydrates into solublv sugars. 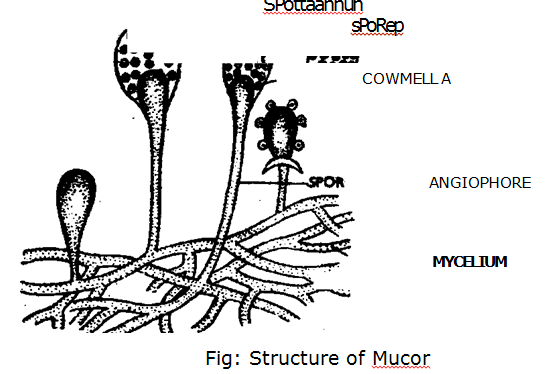 These compounds are then absorbed by the hyphae. 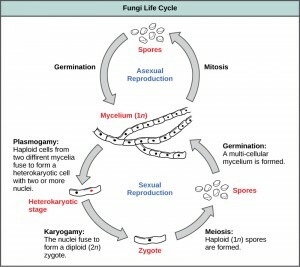 The fungus Mucor may reproduce by vegetative, sexual or asexual means. It is simply by fragmentation of hyphae. 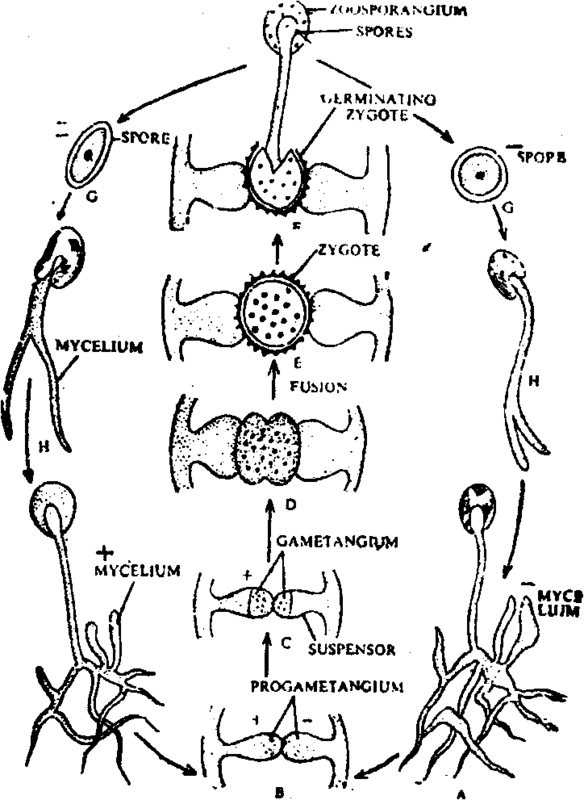 During the favourable cone ition the mycelium gives out some aerial hyphae known as sporangiophore. nutrients and many nucleic are accumulated in tht. young sporangia. The protoplasm is accumulated just below the sporangial wall. Vacuoles are formed in the central region of the sporangium. A swollen vegetative columella develops in the centre ofprotoplasm. Columella is a sterile structure. Protoplasm surrounds the columella. This protoplasm begins to divide in small protoplasmic bits from outside to inside. Each small protoplasmic bit contains 2-10 nuclei in it. They are called the aplanospore. At maturity the outer wall of sporangium bursts. The spores come out and are dispersed by wind. Each spore on suitable conditions germinates. It produces germ tubes. This tube develops into new mycelium. In Mucor the asexual reproduction also takes place. It takes place by the formation of thick walled intercalary chlamydospores or by formation of oidia. The oidia are formed in liquid media. They also cause the fermentation of sugar solution in which they are developed. The mycelium becomes septate. Thus the thin walled segments of oidia are separated from each other in the liquid medium. The oidia increase in number by budding. This stage of Mucor is called “torula condition”. Alcohol is produced during fermentation. Mucor is dioecious and heterothallic. 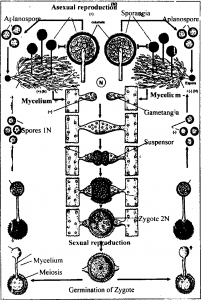 The male and female mycelia are morphologically identical. But they are different physiolagically. Thus they are represented by + (positive) and — (negative) strains. 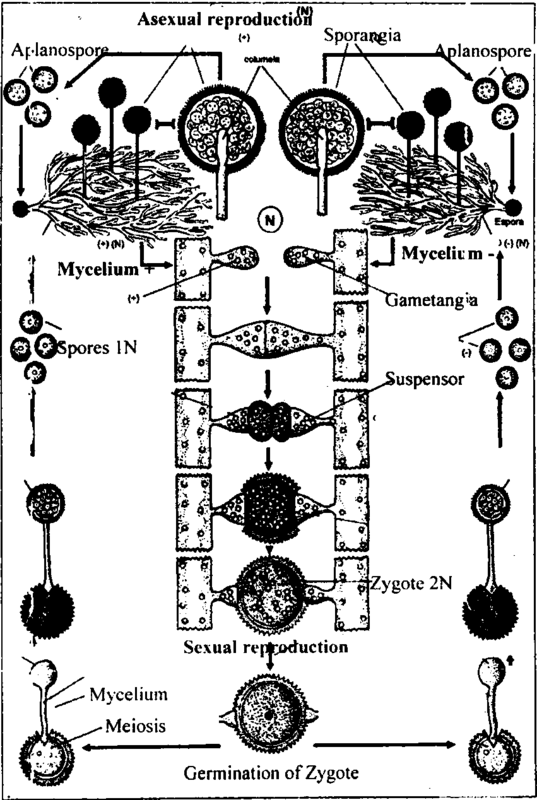 During sexual reproduction two hyphae from mycelia of different strains grow towards each other. Such hyphae are known as progametangia. with each other at their tips. Their tips swell uk. : and a transverse septum develops in each progametangia. It differertiates a “erminal cell or gametangium. The remaining part of progametangium is called suspensor. The gametangia of both strains are multinucleate. 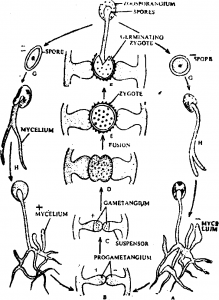 Therefore, the gametangium is called coenogamete. These two coenogamete ‘use together. Their intermediate wall dissolves and zygote or zygospore is formed. fhe zygote later develops a thick wall made up of two layers. The outer layer is called as exospore and inner i; called endospore. The zygote passes unfavourable environmental conditions. On the return of favourable conditions it germinatcs. Its wall split open and a single hypha grows out. This hypha terminates in a sporangium. 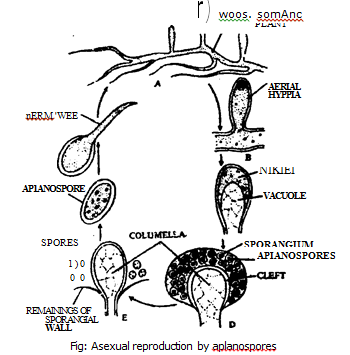 The spores produced in this sporangium give rise to new mycelium. 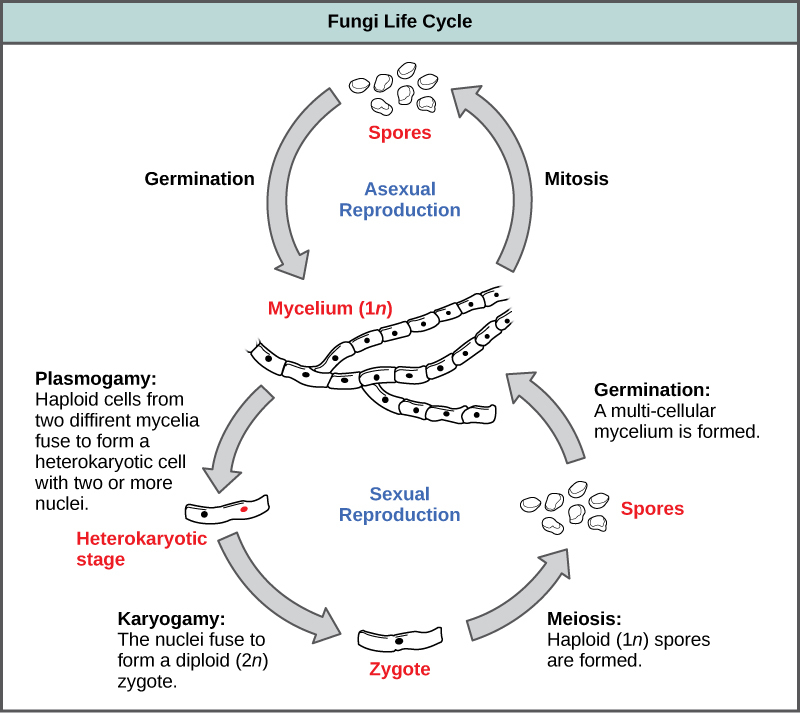 Reduction division occurs at the time of germination of zygote or at the time of formation of spores. Sometimes, gametes fail to fuse. They behave like spores. Such sporas are called azygospores. These spores develop into new individual. 1. 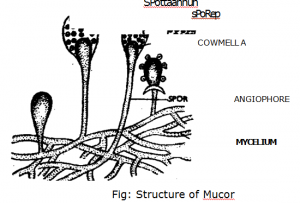 Allergy: Mucor sp. are often found in soils, dead plant material (hay), horse dung, fruits and fruit juice. It is also found in ‘either, meat, dairy products, animal hair, and jute. It is almost always in house dust, frequently in air samples and old dirty :arpets. One study of the most frequent molds found in house dust in samples of homes found Mucor in 98% of the samples from homes. Wood chips and sawdust are often attacked by Al plimbeus. It causes wood chips disease and furrier’s lung. Accumulated dust in ventilation ducts may contain high concentrations of viable Mucor spores. Asthmatic reactions to Vhicor have been described. Mueorosis: It may cause skin and bronchial allergenic reactions. t is an opportunistic pathogenic organism and it may cause mucorosis in immune compromised individuals. The sites of nfections are the lung, nasal sinus, brain, eye, and skin. Infection may have multiple sites. Nucor. together with Rhizopus, is one of the most quickly invading organisms. They are able to contaminate many kinds of aored food products.